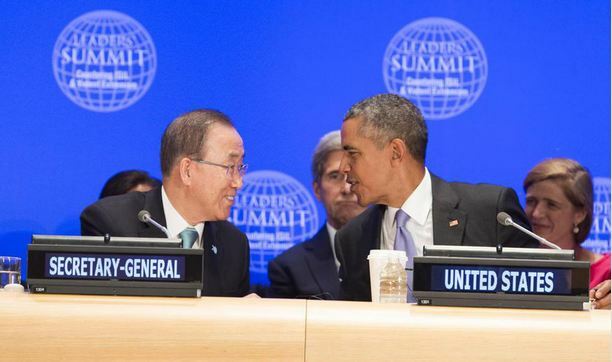 The Leaders’ Summit on Countering Violent Extremism, hosted by United States President Barack Obama on the margins of the General Assembly’s annual high-level debate, brought together representatives from more than 100 nations, more than 20 multilateral institutions, some 120 civil society groups from around the world, and partners from the private sector. “Addressing this challenge goes to the heart of the mission of the United Nations, and it requires a unified response,” stated Secretary-General Ban Ki-moon, who intends to present a comprehensive Plan of Action to Prevent Violent Extremism early next year to the General Assembly. When Sister Helen Prejean tells of her experience fighting the death penalty in the United States, a room full of diplomats, students, and activists listens. Photo credit: End Executions campaign on Facebook. As momentum continues to build towards abolishing the death penalty, Secretary-General Ban Ki-moon attended a special event organized by the UN human rights office (OHCHR), stressing the need to ensure that the rights of victims and their families are respected as part of efforts to ensure a life of dignity for all. The UN Secretary-General’s Envoy on Youth hosted a side event on youth entrepreneurship for sustainable development. Designated in 2009 by the UN Secretary-General as his Special Advocate for Inclusive Finance for Development, Her Majesty Queen Máxima joined the event as a special guest. The side-event served as platform to showcase young social entrepreneurs working on social ventures and innovations to implement and address the Sustainable Development Goals and provided attendees the opportunity to listen to industry leaders on inclusive financing and measuring social impact. High-level event on LGBTI rights. Photo credit: @Free_Equal on Twitter. Twelve UN agencies today called for an end to violence and discrimination against lesbian, gay, bisexual, transgender and intersex (LGBTI) adults, adolescents and children, and set out specific steps to protect these individuals. At a high-level event on LGBT rights, Secretary-General Ban Ki-moon applauded the agencies for “speaking in one voice” on this critical issue.